List of contributors. Preface. Overview (D.S. Prasada Rao, J. Salazar-Carrillo). Global, Regional and Sectoral Comparisons. International comparison program in the 1980's and 1990's (Z. Kenessey). Latin American comparisons for 1985 (J. Salazar-Carrillo). Intercountry comparisons of agricultural output and productivity 1970-1990 (Statistics Division). A perspective on international comparisons of capital (M. Ward). Comparative price and productivity levels: Korea and the United States (D. Pilat). China: The dollar value of gross domestic product (R.M. Field). An assessment of the United Nations scale of assessments 1946-1994 (L.H. Officer). Methodological Issues. Van IJzeren's method of international price and volume comparison: An exposition (B.M. Balk). Consistency in aggregation principle for multilateral comparisons of purchasing power parities and real products (S.H. Khamis). Stochastic approach to international comparisons of prices and real income (D.S. Prasada Rao, E.A. Selvanathan). Structure of international prices: A production-based approach (Y. Kurabayashi). A reconsideration of log-change index numbers for international comparisons (D.S. Prasada Rao, J. Salazar-Carrillo). Regression estimates of percapita GDP based on purchasing power parities (S. Ahmaed). The PPP doctrine, long term exchange rates and a new method to estimate real gross domestic products (E. Lancieri). Productivity, factor endowments, military expenditures, and national price levels (J.H. Bergstrand). The present volume provides a timely collection of material on the subject of international comparisons, contributed by leading scholars from an extensive range of relevant disciplines and geographical backgrounds. The papers in this volume have been classified into two broad groups united by overlapping themes. Part I includes essentially empirical papers intended to provide a clear picture of the different types of international comparisons that have been undertaken by various organizations and individuals. The papers relate to empirical studies of different sectoral and national income aggregates at both regional and global levels. The papers in Part II deal with methodological and analytical issues. Discussion of the appropriateness of various aggregation methods for international comparisons accounts for a major component of this section. 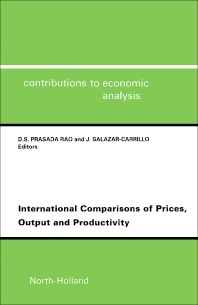 The volume provides a set of stimulating studies on international comparisons of prices, output and productivity, and will provide a useful reference source for many interested readers around the world.